Buddy the French Bulldog has possibly the most ear piercing death yodel I have ever heard out of a French Bulldog. As of this moment, he is the penultimate winner of the “Death Yodel Championship Trophy”. If you think your dog has what it takes to beat him, send me a link to a video of them in action. That’s Wyatt Earp, aka Golden Hat Eney. He was also HIT at the 2009 French Bulldog National Specialty, in Boxborough, Maine. Wyatt is owned by Karen Carlin. In Europe, one of Tessa’s grandsons has his Schutzhund I title, which I find not at all surprising. Years back, I was dating a Schutzhund enthusiast, and idly thinking of trying it with my American Bulldog, Jack. 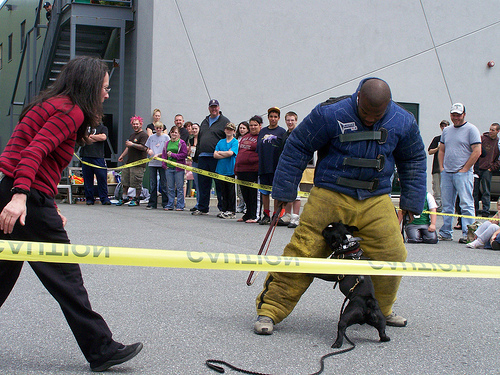 Jack was a total washout at Schutzhund – he didn’t have a protective bone is adorable body. Tessa, on the other, almost launched herself through the windshield of the car the first time she saw the ‘suspicious stranger’. For fun (isn’t there always one, at any training facility? ), someone suggested we see how she’d hit a sleeve. Hit it she did, with the velocity of a small freight train, and hung on with grim determination. All those sessions of playing “swing the Frenchie” with her rope toy paid off… I think she felt she’d finally found her perfect calling as a dog. It might be fun to try Schutzhund with Dexter, once his show career is over. He has that perfect blend of drive and agility, plus he really like swinging from things. Tessa, Pammy, Dexter, Rebel and Solo wish you a Merry Christmas, in a very French Bulldog specific way. If you own a French Bulldog, you’ll instantly know why this is the most ACCURATE holiday greeting ever.